Favignana, Marettimo and Levanzo are the names of the three principal Egadi Islands, located off the magnificent western coast of Sicily. This article focuses on Favignana, the largest one. It is situated between Trapani and Marsala, and its proximity to Trapani international airport makes it easily accessible, while remaining unspoilt. 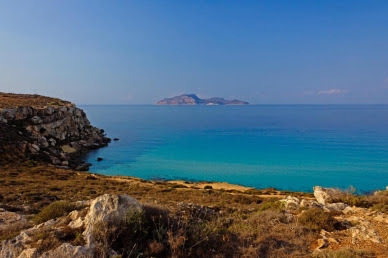 It has a land area of about twenty square kilometres and the two plains on either side of a chain of hills have given Favignana its "butterfly" nickname. A tunnel running through the hills connects the two parts. The island is composed mostly of calcareous boulders, and visitors are also usually fascinated by the "cave di tufo", huge cavities which are the result of years of quarrying. These gaping holes can surprisingly conceal a precious area of greenery, or be filled with pretty pools of sea water. The most wondrous can be found around Scalo Cavallo, Bue Marino and Cala Rossa. The rugged coastline means that the beaches are often small and sometimes hard to access, but Favignana is a sought-after spot for all types of diving activities. Its turquoise waters have been protected by a marine reserve and there is no shortage of diving centres. The main town, also called Favignana, is where the ferry stops. Built around a pretty port, it is dominated by Santa Caterina Fort, once a Saracen observatory post, nowadays in military hands. Facing the sea, the heritage of the rich Florio family, which used to be active in the production and export of Marsala wine as well as tuna fishing, can be found. It takes the shape of the Palazzo Florio and the tonnara (tuna fishery). Tuna fishing is still going strong, Favignana being one of the few places in Italy where the bloody mattanza method is still alive. It is however a historic ritual performed every year in May or June, and one of the principal tourist attractions. Apart from scuba diving, snorkelling and swimming, other options include boat tours and cycling. You can hire your own craft, or participate in an excursion. Boatmen will also come to you spontaneously in the harbour, with ideas of a trip to secluded beaches or around the island. You can book a fishing trip too. With its flat landscape, exploring the island on a bike is popular. If you did not bring your own, you can hire one at a low cost without problem, and either set off alone or join a guided tour. For sustenance, you have a choice between shops selling everything from tuna steaks to take-away pizze, or a wide range of restaurants. The prices are fair for a touristic place, and if you like fish and seafood you will be in heaven. Are you after authenticity and unpretentious beauty? Then Favagna is for you.